Over the past four months, the Arakan Army (AA) — a Rakhine Ethnic Armed Organization (EAO) — has emerged as a formidable insurgent actor in western Myanmar, particularly Chin and Rakhine states. The AA’s insurgency is based on a mix of conventional and subversive tactics, aimed at gaining strategic dominance in the short term and political-territorial control in the medium-to-long term. Much of its future strategies and operational design will depend on its relationship with the local population and the frequency and degree of the military’s response. Since it began its southward expansion from Kachin State into Chin and northern Rakhine States in 2014, the AA has gradually moved from employing a purely conventional strategy of attacking Tatmadaw positions in remote frontlines to a more hybrid strategy, entailing two distinct approaches. 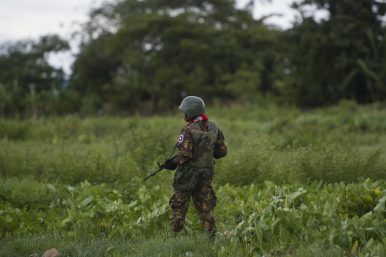 First, the AA has increased the frequency of its attacks on the military and has expanded its conventional frontlines around Chin state’s Paletwa Township and northern Rakhine state’s Maungdaw, Buthidaung, Rathedaung and Kyauktaw Townships. The key aim of this approach is to challenge the Tatmadaw’s tactical dominance in the region and gradually push it southwards. In this regard, the AA has achieved significant strides in the past few months. For instance, it has carried out fatal hits on the Tatmadaw’s rank-and-file, including on several high-ranking officers. Recently, it captured a tactical command base of the military along the Chin-Rakhine border and reportedly captured 11 soldiers. On the other hand, AA has itself suffered heavy casualties, outnumbering 2018’s tally of 75 so far this year, as claimed by observers. This is not unexpected given the overall strike superiority that the battle-hardened and heavily-armed Tatmadaw enjoys over the relatively weaker AA. Second, since late last year, the AA has been targeting local administration and law enforcement personnel in Rakhine state. It has particularly singled out the state police, flagging them as collaborators of the Tatmadaw—the January 4 and March 9 attacks on police outposts being cases in point. It has also attempted landmine attacks and ambushes against government and police convoys—including on Rakhine state’s chief minister—and carried out kidnappings of local administrators and police chiefs. The AA’s intent here is to generate fear and anxiety amongst those whom the group believes are directly working with the military or providing political sanction to its operations. This two-front strategy, which is duly backed by a swelling cadre base, stable supply lines, and increasing popular support among the local Rakhine populace indicates not just a high level of tactical sophistication, but also an ambitious strategy to upend the state’s control over Rakhine state. This can have two distinct outcomes that would cumulatively allow the AA to gain leverage at the negotiating table: they weaken the state’s credibility as a security provider, and increase the Tatmadaw’s costs of fighting at the conventional frontlines. By staging attacks on softer targets, the AA also hopes to balance the force asymmetry between them and the Tatmadaw. While the AA has not exhibited any signs of establishing a parallel government in Rakhine state as yet, it has indicated its desire to establish some permanent force presence. It is clear that the AA wants to break the Tatmadaw’s hegemony as a legitimate security actor in Rakhine state and establish itself as a security guarantor for the local people, much like the United Wa State Army (UWSA) in Shan state. While this does not directly entail any political mandate, it is inevitable that the AA would begin to command political influence in the longer term, especially given its broad influence over the Rakhine nationalist discourse and popular narratives at the moment. Furthermore, it is crucial to note that the AA draws a fair share of its finances from the local population, particularly the Arakanese business elite and expatriate community. This means a local conflict economy has already emerged with entrenched groups investing in a group in which they seem to have much confidence. This will help the AA influence Rakhine politics in decisive ways and embed itself in local political structures, which it can use in the long term to assert permanent political influence. For now, it appears that if the Tatmadaw continues its ground-and-air offensives and use of arbitrary force against Rakhine civilians, the AA is unlikely to back down. To compound the situation, the AA’s strategic allies from the Northern Alliance may join the battle, if the recent statement to this tune by the Shan state based Ta’ang National Liberation Army (TNLA) is any indication. Yet, an interceding political agreement might bring some temporary ease. The AA recently participated in informal talks with the union government in Naypyitaw alongside other non-ceasefire EAOs from the north, following which a five-point agreement on reducing clashes and meeting every two months was signed. On this, an AA spokesperson said that clashes might reduce if all parties respect this agreement. At the same time, according to the AA spokesperson, the Tatmadaw and the AA clashed 20 times after the talks, following renewed offensives by the military. The AA, which remains well-financed and well-armed for now, has also maintained its offensive posture, as the March 23-25 attacks on Tatmadaw columns in Rathedaung and Kyauktaw show. Thus, it is too early to say if the clashes would subside anytime soon. Angshuman Choudhury is a New Delhi-based policy and strategic analyst, currently working as a senior researcher at the Institute of Peace and Conflict Studies (IPCS) and coordinating its Southeast Asia Research Programme. A version of this article was originally published in the IPCS blog. A closer look at the latest burst of conflict in a troubled region of the country.